The D´ADDARIO EXL110 ELECTRIC GUITAR SET is out of roundwound nickel-plated steel, has a distinctive bright sound and excellent inntonation, along with regular light gauge, 010-046 and 6-strings. 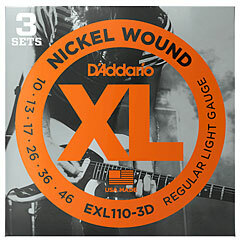 D'Addario is one of the big names in the string industry. You can even say without exaggerating that the XL series of strings belongs to the most distributed strings. Alongside the standard strings they also have special low tuning, Baritone and Flat wound strings.